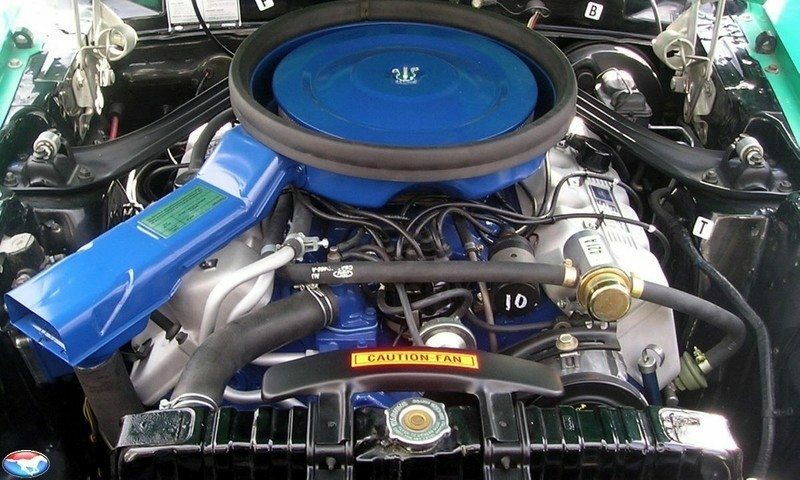 After a few years of watching Chrysler’s Hemi eat up the competition on the race tracks of America, Ford knew it was time to live up to its “Total Performance” image and create a dominating power plant. Using new block castings for what was to displace 429 cubic inches, a new design surfaced that was years ahead of the existing 427 “FE” technology. And, although the new monster engine could have easily propelled the heaviest Lincoln, it promised unmatched performance using the lightweight advantages of the Mustang platform. Ford’s decision to build the Boss 429 Mustang was undertaken with two goals in mind. First was to homologate the engine for Grand National competition. The second reason was to produce a car that could out-hustle a 426 Hemi-powered Chrysler. Custom builder Kar Kraft was selected to shoe-horn the massive block into the little Mustang, and in January 1969, production began. A purpose built facility at Brighton, Michigan allowed for quick and efficient modifications. Only a limited few production Cobra Jet Mustangs were pulled off the Ford Dearborn production line and shipped to Brighton where they were partially disassembled and manually rebuilt into Boss 429s. The original intent was to make 500 units, but total output ended at 857 Mustangs in 1969. 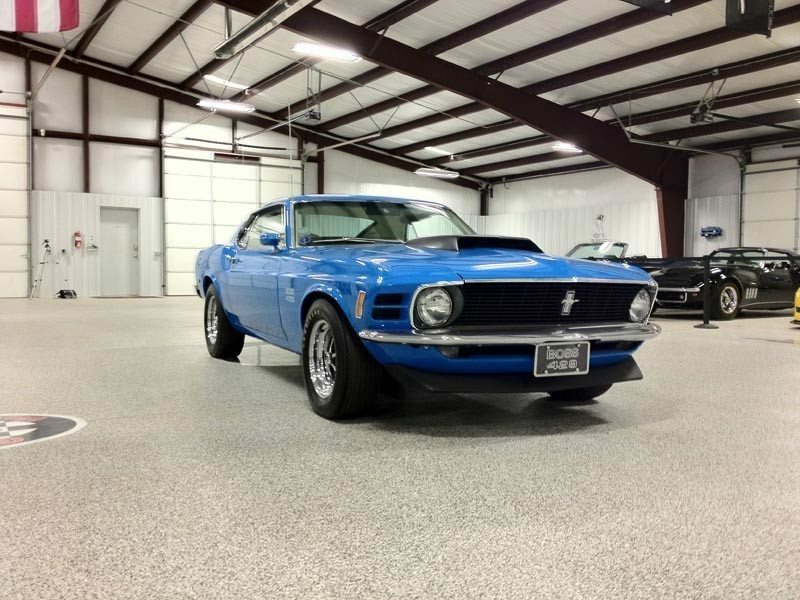 By the end of the 1969 production run, the story of the Boss 429 Mustang had spread through all the Ford Dealers and demand was so high that another run of 499 1970 models was started in August of 1969. These were completed by December 1969. Visually, all the Boss 429 models had two very distinctive and unique features: the prominent front “BOSS 429” decals on the rear of each front fender, and a large hood mounted air-scoop with a manually controlled intake flapper valve. The cars also came with full deluxe interiors, power steering, close ratio gearboxes, low ratio Traction-Loc differentials, and 15 x 7 Magnum 500 wheels as standard. The Boss 429 is one of the rarest and most desirable muscle cars ever, with gobs of torque and spectacular acceleration. 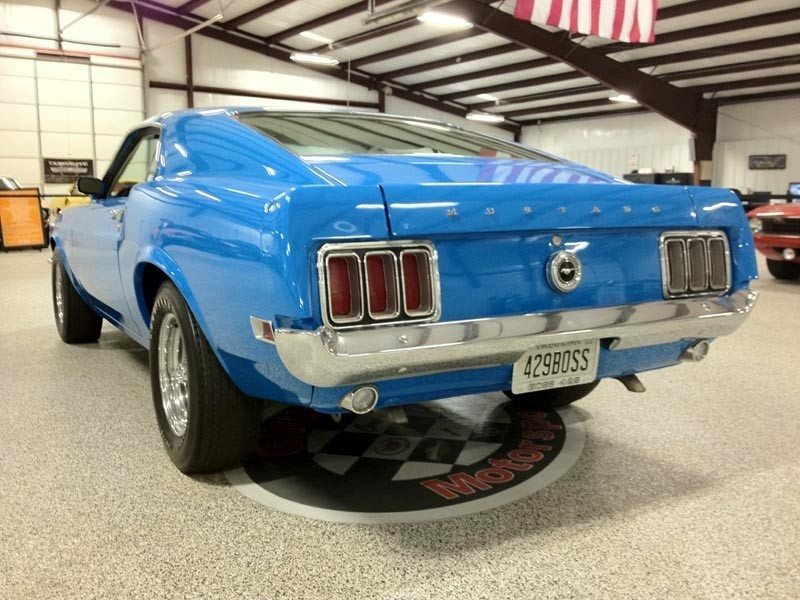 This spectacular Grabber Blue Boss was nut and bolt restored to a high standard, utilizing all original body panels and exclusively NOS parts. The entire drivetrain is numbers matching, and every label, mark, nut and bolt is correct. The fit and finish of the paint and brightwork is outstanding, it is complete with factory Magnum 500 wheels and correct tires, and the attention to detail during restoration is evident throughout the car. 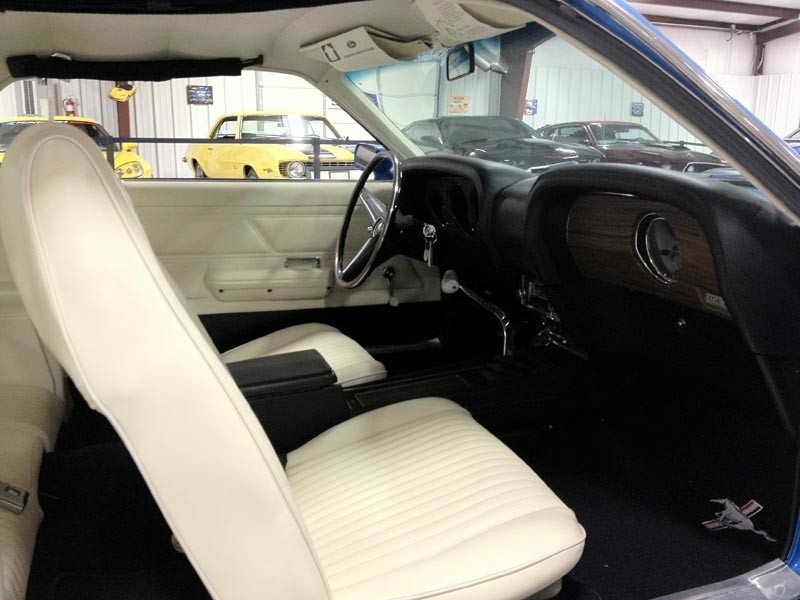 The white interior is clean and proper, the wood grain dash and 3 spoke wheel are excellent, and all interior items are tidy and proper. Open the hood, and there’s a lot of horsepower packed into that engine bay. This car is wonderfully clean and correct, right down to finishes, hoses, and clamps, and the big 429 sounds great as it motors down the road. The chassis is as clean as the engine, and there is nothing needed here before finding a podium position at any Ford or Mustang event. This beautiful car comes complete with the essential Marti Report, which documents the authenticity, and is as clean and correct as any Boss 429 we’ve ever seen. 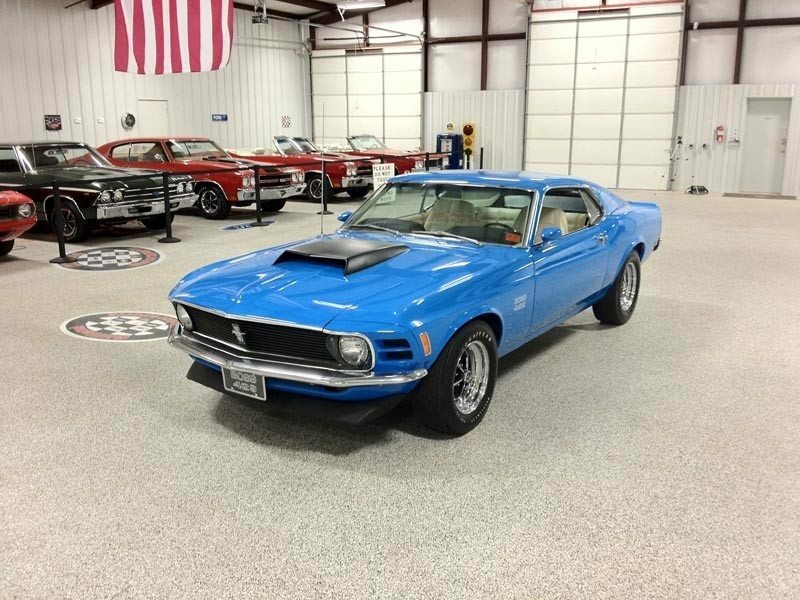 It’s one of 499 built in 1970 and is lovely example of a blue chip world-class muscle car. If you have a Ford Mustang Boss or another collectible you’d like to insure with us, let us show you how we are more than just another collector vehicle insurance company. We want to protect your passion! Click below for an online quote, or give us a call at 800.678.5173.